The central processing unit (CPU) in a computer might receive the lion's share of attention when it comes to overclocking, but it isn't the only PC component you can tweak. Vendors regularly overclock the GPU (graphics processing unit) of a graphics card and release it as a new product. With the right tools, increasing the clock speeds on a graphics card can be an easy way to boost performance. Just remember, there's always a chance overclocking could damage your PC components (not to mention your warranty! ), so it's not for the faint of heart. Overclocking a video card successfully is all about managing the heat that is generated, just as it is when overclocking a CPU. When taking a graphics card to its extremes, vendors often replace the standard cooler with a bigger fan or an improved heatsink (or even add liquid cooling) in order to disperse the extra heat. Unless you're willing to modify the cooler (we recommend you don't), the limits of your overclocking will be determined by how cool the graphics card is prior to tweaking and how much heat the cooler can handle before the graphics card becomes unstable. Most overclocking is achieved through a software utility. Some vendors provide dedicated tweaking utilities or have overclocking utilities that are part of the driver package. ASUS, for example, provides two utilities — iTracker with its Republic of Gamers range and SmartDoctor with its other video cards. ATI bundles its own Overdrive utility with the driver package for ATI-based graphics cards, allowing you to tweak clock speeds and even test to see if the card is still stable before confirming the new speed settings. There are several third-party overclocking utilities also available. Of these, RivaTuner is one of the best, as it provides numerous options to tweak and monitor your graphics card's performance and health. The only downside to third-party utilities is that they generally aren't updated as often and may not support the latest and greatest graphics cards as soon as they are available. Once the software utility is installed, overclocking is a matter of testing and retesting. For example, in ATI's Overdrive — available by entering the Advanced Mode of the ATI Catalyst Control Centre — you can set your desired clock speeds for both the GPU core and the memory and hit "Test Custom Clocks". If the clock speeds are stable, raise the clock speeds higher until you find a comfortable compromise between stability and speed. ATI also offers an auto-tuning mode, a lazy but worthwhile alternative. RivaTuner doesn't provide the same testing option before setting the clock speeds, so it is important to increase clock speeds in small increments in order to avoid any potential problems; increasing by 10MHz at a time is advised. Of course there is always the question of whether overclocking your graphics card will actually provide better performance. Successful overclocking can only be judged on a case by case basis, but some cards do generally fare better than others. 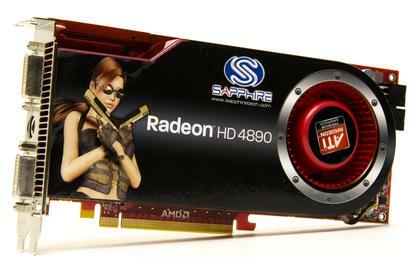 The newly released ATI Radeon HD 4890, for example, is an excellent overclocker as the core GPU clocks can be increased up to 150MHz over default clocks when using the standard air cooler.